2 bedrooms, 1 bathroom, a large living/dining area. Free wifi and cleaning. THE APARTMENT AND THE RESIDENCE: AN IDEAL LOCATION IN THE HEART OF PEREYBERE, A CHARMING AND AUTHENTIC WELL-SERVICED VILLAGE. Ideally located within 2 to 5 minutes' walk to fabulous beaches, restaurants, shops, excursion agencies and all amenities, this spacious and bright 2 bedroom apartment is fully air-conditioned and tastefully furnished. There is a double-bed in one bedroom and a 2 wide single beds in the other bedroom. The apartment benefits from unlimited fibre optic wifi as well as all mod cons, including a digital safe, a flat screen television, an alarm system and a DVD/CD player. Bed linen and bathroom towels are provided, and your bed will be made prior to your arrival. The grounds of this private residence boast tropical gardens and a large, newly refurbished swimming pool with the latest ecological water treatment system free of salt and chlorine. On request, we will arrange for free parking at the residence. A concierge resides in a lodge at the entrance to the residence. Included in the price, our lovely English and French speaking housekeeper, Marceline, provides a daily cleaning service (Monday to Friday, excluding bank holidays). Marceline will welcome you on arrival, show you around, give you the keys and ensure that your stay is comfortable and enjoyable. Books, beach toys, a travel cot and a highchair are available on request. On request and with prior notice, Marceline is always delighted to prepare a delicious traditional Mauritian meal at a very modest price (250 - 350 Rupees per person per meal). She will also take care of your laundry on request (250 Rupees per load, washed and ironed). These services can be arranged directly with Marceline during your stay. On request, we will organise your airport taxi transfer with our reliable driver, Nanda. If he is not available he will ensure a dependable airport transfer service through his network of reliable drivers. The airport transfer price (each way) is 1,700 Mauritian Rupees, payable to the driver. Should you wish to do so, you can also use Nanda's services for full day excursions on the island. Should you prefer to rent your own car, "ARA Tours", a car rental agency, is located less than 5 minutes walk from the apartment. Our guests are charmed by Pereybere's authentic village atmosphere while benefitting from an array of local amenities within a few minutes' walk from the apartment. All amenities are 1-5 minutes' walk: excellent reasonably priced restaurants serving delicious local and international cuisine, bars, a very well stocked supermarket with a bakery section for breakfast ("Winners" supermarket is only 2 minutes walk from the apartment), several excursion/scuba diving & car/bike hire centres, a taxi stand, bus stops and ATM machines. There is a doctor and beautician/hairdresser nearby. Opposite the apartment is also a chemist. Some of the best beaches on the island are right in Pereybere, all within a few minutes' walk from the apartment, with no roads to cross. These beaches are fabulous with fine white sand and turquoise waters. There is the choice between the more lively Pereybere public beach and more secluded, tranquil beaches and coves. At Pereybere public beach the sea is like a giant swimming pool - fine sand under your feet (no prickly corals or sea urchins) and a nearly waveless turquoise lagoon with no current that makes for very safe swimming. This beach also offers an array of water sports. "Filaos" trees span the entire rear of the beach offering shade throughout the day for those who prefer it. There is also plenty of room on the beach for sun lovers to enjoy. There are two restaurants on the beach with a sea view as well as stalls offering very inexpensive delicious local snacks and specialities. One end of the beach offers a variety of water sports, including pedaloes, kayaks, water skiing, towable doughnuts and glass bottom boat tours. In Pereybere, there is also a series of less frequented, wilder coves and beaches at Pointe d'Azur", again a few minutes' walk in the other direction from the apartment, which have no amenities but are tranquil and beautiful with stupendous views of "Coin de Mire" island. These waters are a delight to snorkle in. You can walk for miles along fabulous stretches of beaches towards Bain Boeuf and then onto Cap Malheureux. - Yacht/trimaran/catamaran/boat day cruises to offshore deserted islands, all with immaculate beaches (with barbecue, stops for swimming and snorkelling); most of the boats depart from Grand-Baie. -- Half day/full day deep sea fishing (marlin, tuna and other species). Line fishing is also possible. - A trip on the Nessee semi-submersible boat in Grand-Baie, 5 minutes drive from the apartment, is a great way to discover the beautiful marine life without getting wet. At some point during the outing, the semi submarine stops along the reef giving you the opportunity to snorkel along the beautiful coral reef. - The Captain Nemo’s undersea walk, takes place in the lagoon near Grand-Baie and is a great activity for non-divers and children over 7. A helmet with a transparent visor is placed on your head allowing you to walk 3 to 4 meters deep on the ocean floor to enjoy, the corals and wide variety of fish. - You can discover the undersea world at a depth of 35 meters aboard the "Blue Safari Submarine" in Trou aux Biches, about 20 minutes drive from the apartment: it's great for anyone over the age of 3. If you prefer, you can also ride an underwater scooter, 3 metres under the sea! - You can also kite surf with the Mauritius Kitesurf School, KiteZone Ltd, in Anse-La-Raie, about 10 minutes drive/taxi ride from the apartment. - The resort town of Grand-Baie with its charming shopping arcades, restaurants on the water's edge, bars and a market with local souvenirs is 5 minutes away by taxi or bus. - Quad biking in Anse-La-Raie: we highly recommend this fun and thrilling activity only about 10 minutes drive/taxi ride from the apartment. Enjoy a 2 hour safari on a quad bike across the beautiful rivers and dense forests of Anse La Raie, whilst learning about the history of Mauritius and its flora. - "L'Aventure du Sucre", an old sugar mill converted into a stimulating museum retracing the history of Mauritius is also 15 to 20 minutes drive away. - Visit the restored, grand colonial mansion of "Chateau de Labourdonnais", its lush gardens, old orchards and distillery where you will learn about the old production techniques of agricultural rum. It is about 20 minutes away. - For another journey into the past, we suggest you visit "La Demeure St. Antoine" in Goodlands. It is an old mansion filled with the elegance of a bygone colonial era. It's also a perfect place to have aperitif in the gardens followed by a lovely meal on the veranda facing the beautiful gardens. Only about 20 minutes drive away. - The island's capital, Port-Louis and its exotic markets, modern shopping complex and museums, is about 40 minutes bus/taxi drive. - Nearby luxury hotels with access to their evening entertainment and "sega" dance shows. Pereybère lies on the North/North west coast, which is the most sheltered from winds. It enjoys a clement local climate making it a great all-year-round destination. The apartment benefits from a bus stop nearby. Regular buses go to Grand Baie in 5 minutes, Cap Malheureux in 10 minutes, Grand Gaube in 15 minutes, Goodlands in 20 minutes and Port Louis in 45 minutes with links to the rest of the island. There is also a taxi stand a few minutes walk from the apartment. First of all, a warm hello from Sandra and Mark. Thank you for your interest in this apartment. We are based in London but our hearts are in Mauritius, and especially the seaside village of Pereybere where the apartment is based. We think it's one of the most attractive spots on the island and go there whenever we can! We are delighted to share our apartment and our love of Mauritius with our guests so please do not hesitate to contact us by phone, text, WhatsApp or by email through the website for any additional information. On arrival, our lovely housekeeper, Marceline, will be delighted to welcome you, give you the keys and answer any questions you may have. She will be cleaning the apartment every day (except weekends and bank holidays). To book this apartment, please kindly follow the instructions on the website. - Unusually spacious and bright living/dining room area for a 2 bedroom apartment. - The apartment is air-conditioned throughout: the living/dining room as well as both bedrooms. - Good quality bed linen provided and beds made prior to your arrival. Towels for indoor use also provided. - The residence boasts one of the larger swimming pools on the island for a private residence. It has recently been refurbished with a chemical-free "Oxymatic" cleaning system. - Our lovely housekeeper, Marceline, who welcomes our guests on arrival and cleans the apartment 5 times a week (included in our advertised nightly price) is always delighted to prepare on demand a delicious traditional Mauritian meal for a modest fee (250 - 350 Rupees per person per meal) . She can also take care of your laundry (250 Rupees per load, washed and ironed). - The residence is on the beach side of the coastal road running through Pereybere. There are no roads to cross to walk to an array of wonderful beaches, 3 to 5 minutes walk from the apartment. - The apartment is only 2 to 3 minutes walk from a very well-stocked supermarket, with also has a bakery section. - All amenities: a bus stop, taxi stand, restaurants, car rental agencies, diving centers and tour agencies are between 1 to 5 minutes walk from the apartment. - If required, we can organise your airport taxi transfers through a reliable English and French speaking driver (1,700 Rupees per transfer). - During your stay, the taxi service is also available for a wide variety of bespoke half and full day excursions. Some of the best beaches on the island are right in Pereybere, all within a few minutes' walk from the apartment, with no roads to cross. These beaches are fabulous with fine white sand and turquoise. Our guests are charmed by Pereybere's authentic village atmosphere while benefitting from an array of local amenities, great transport links, all within 1 to 5 minutes walk from the apartment. Incoming calls only but, as we offer unlimited fibre optic wifi, you will be able to make free FaceTime, WhatsApp or Skype calls via your phones or computers. Remote controlled air-conditioning in both bedrooms and also in the spacious and bright living/dining room. Good quality bedding and beds are made prior to your arrival. There is a washing machine in the apartment. However, if required, our housekeeper can take care of your laundry on request (250 Rupees per load, washed and ironed). As all the beaches, shops, restaurants & transport links are on your doorstep, a car is not necessary during your stay. However, should you rent a car, free parking is available at the residence. Bathroom towels are provided but please note that they are not for beach use. We do not provide towels for beach use. Spacious and bright air conditioned living/dining room with sliding doors leading to a balcony. Plenty of crockery, pots and pans and kitchen utensils provided. The kitchen is well-equipped to prepare your own meals. However, with prior notice, our housekeeper can prepare a delicious traditional meal for a small fee (250 - 350 Rupees per person per meal). Please note that although the pictures show a small old style television, it has now been replaced with a larger flat screen TV. The satellite channels are mainly French language channels but there are also some English language channels, including BBC World. We can provide beach toys on request. Please note that we can also provide a baby travel cot which has an extra thick mattress (for more comfort) and a baby high chair. The garden is communal and boasts tropical vegetation which attracts beautiful and colourful exotic birds. There is a caretaker couple residing in a lodge at the entrance of the residence. Please note that the apartment is located on a raised ground floor, only accessible by climbing one or eight steps depending on which entrance you use. For this reason, unfortunately the residence is not wheelchair accessible. To reach the level where the apartment is, there are two possible entrances to the building. When entering the residence via the side entrance near the caretaker's lodge, there is only one step to climb (but quite a high step). When you enter the residence by the main middle entrance, there are 8 easy standard size steps to climb. Included in the price, our lovely English and French speaking housekeeper, Marceline, provides a daily cleaning service (Monday to Friday, excluding bank holidays). On arrival, she will show you around, give you the keys and ensure that your stay is enjoyable. On request & with prior notice, she can prepare a delicious traditional Mauritian meal at a very modest price (250 - 350 Rupees per person per meal). She can also take care of your laundry on request (250 Rupees per load, washed and ironed). These services can be arranged directly with Marceline during your stay. In addition, on request, we will organise your airport taxi transfer with our reliable driver, Nanda. If he is not available he will ensure a dependable airport transfer service through his network of reliable drivers. The airport transfer price (each way) is 1,700 Mauritian Rupees, payable to the driver. We spent some days in Pereybere, Marceline welcomed us warmly and we had a great stay. Thanks! The property was as described in the advert. We were met by Nanda, the taxi driver, at the airport and greeted by a smiling Marceline at the flat. We stayed for a month; this was our second stay in the apartment block, but the first in the two bedroomed flat. It was clean and bright and Sandra and Mark were extremely helpful. We enjoyed a delicious meal cooked by Marceline and went out on a trip in Herve's boat which was great fun. Our two adult children joined us and they liked snorkelling, diving and swimming. The beaches are beautiful and close to the apartment. We ate out at several restaurants and the Thai was our favourite. Shops, buses and amenities were close by. We recommend this flat and are returning next year. Great apartment in wonderful location. Good facilities and housekeeper Marceline keeps the apartment clean. She is very helpful and amenable. There was good communication and I'd definitely recommend this apartment in Mauritius to anyone wanting to explore the island. I went with my family (children 16 &17 years), we particularly enjoyed swimming with the dolphins near Tamarin bay and the local watersports. We also used the local hotel/restaurant facilities at the Hibiscus which had welcoming staff. Overall, a very pleasant family holiday. We had a wonderful holiday, the Villas were perfect and in a fantastic location for Winners Supermarket and the beach with a chemist directly opposite. The Villas were clean,washing machine was a god send, aircon in every bedroom plenty of storage with wardrobes and draws in every room, verandah off living area.Tv , DVD player, books. Great for a young family with cot and high chair. Security is 5 star with safe, back to base alarm and deadlocks. Pereybere Beach is amazing and only a 3 min walk away. The bus stop is just across the rd and its only a 5 min ride into Grand Bay and only 32rp for adults and 16rp kids. We also caught the bus into Port Louis. The taxi into Grand Bay was only 150rp. We ate at Pereybere Beach Cafe a few times, and ordered in from Wang Thai once would recommend both , we out in a lot as we were just too tired after our days of exploring and a few times ventured into Grand Bay for dinner. Marceline was great, and the 2 dishes she made for us were delicious,it was great to come back from a day out to clean floors, beds made and dishes done. Nanda was waiting at the airport with a big grin on our arrival and boy were we glad to see him! His cars are immaculate and he takes great pride in them. Herve's day trip was also a great experience, I highly recommend. We enjoyed a Catamaran trip to Gabriel Island and a speed boat trip to Benitiers Island visiting Crystal Rock and seeing dolphins. We also spent a day discovering the south visiting Chamarel Coloured Earth and Waterfall, Black River Gorge and Casela Nature Park. Visiting the Church at Cap Malheureux is a must it is a beautiful view and only a 10 min bus ride away. Our 3 weeks went way too fast. We would not hesitate to stay at your Villa's again. Thank you for being so understanding with all our flight changes, but in the end we didn't have any problems with any of our flight, the transfers or the Villas. I would not hesitate recommending these Villas to any one and wish I was still there. Thank you Sandra and Family. 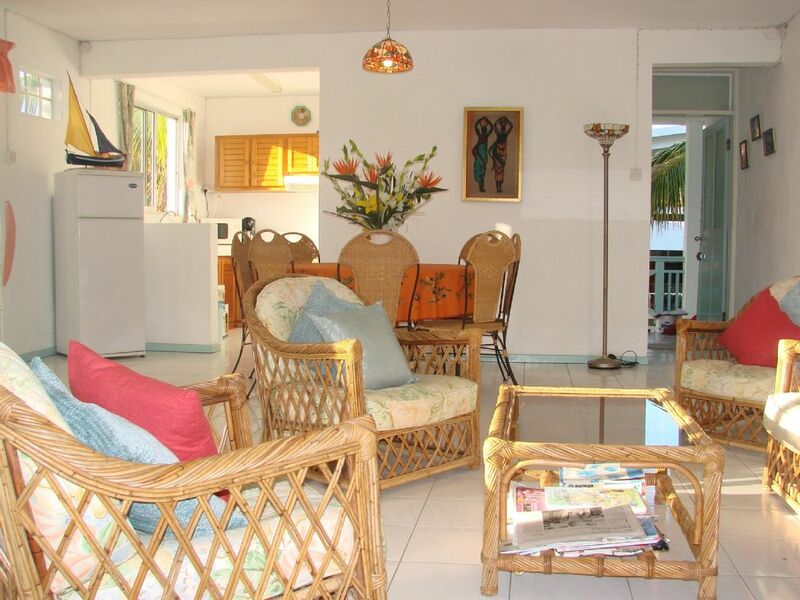 It has been several months since our party stayed in this delightful apartment in Pereybere, Mauritius but our memories are still fresh and vivid and will always remain so. It has been 10 months since our stay and we have been and gone on holidays since then but our stay in Mauritius has topped them all. The apartment was comfortable, clean and well stocked, conveniently located just a few minutes walk from the local village centre and its beaches plus a brand new supermarket. Transport around the local area was easy with the bus stop at the top of the road but what really made our holiday was Nanda, our taxi driver and expert on the local area, Marceline who cleaned the apartment (and even cooked for us one evening for a nominal fee) and our trips with local fisherman Herve. Sandra and Mark armed us with all the info we needed on the local area and who to contact etc and I would thoroughly recommend taking their advice of doing some trips with Nanda and Herve. We had our own personal tour of the island, visiting waterfalls, areas of natural beauty, lagoons full of marine life that we could snorkel in, a giant turtle and alligator park, swimming with dolphins, a trip to the capital (Port Louis) and a trip round a rum factory. Our holiday was absolutely jam-packed with trips and we took up every activity that was on offer, in the knowledge that the rates were fair and that we would be looked after. I would also recommend you go deep-sea fishing with Herve (providing you aren't prone to sea-sickness like some of our group were!) He also does a separate trip to Gabriel Island which is absolutely stunning. A BBQ is also included in the price of the trip with freshly cooked fish, meat and salad. Not to mention a good dose of Mauritian rum! I really can't recommend Mauritius enough. The island has so much to offer and the locals are so friendly. We will always have fond memories of the island and the people we met and hope that we will get to go back someday soon. Our family had the priviledge to stay in this apartment for a little more than 4 weeks. Upon arrival we were glad to find out that the description about the property and the details about its location had been accurate. Sheila made us feel very welcome and the apartment was well-maintained and clean. Throughout our stay we were free to ask any questions and were well-informed and helped all the time. Our kids, aged 3 and 6 enjoyed the stay as well, and had a good time playing in the pool and in the garden, whenever we were at the apartment. As to any activities, we can sincerely reccommend a boat-trip with Hervé and scuba-diving with the dive shop Ocean Spirit, which is a 3 minutes walk from the apartment (they were very good and professional, safe, educational and fun to dive with.) The next-door sympathetic and small restaurant Comme Chez Nous became one of our favourites, nice, cozy and not expensive at all. We´ll come again. The apartment is ideally situated in the well serviced village of Péreybère, on the beautiful sheltered & unspoilt part of the island's North/North West coast. Pereybère has kept its authenticity and is a perfect place to immerse yourself in the island's atmosphere. From Pereybère, beautiful beaches can be walked along for many miles towards Grand-Baie or towards Cap Malheureux. Stunning, safe beaches are only 3 to 5 minutes walk from the apartment. In addition, Péreybère has great amenities: a variety of reasonably priced restaurants offering local and also international dishes, shops, car rental companies, diving centres and excursion agencies offering various land and water activities. There is a very well-stocked supermarket ("Winners") only 2 to 3 minutes walk from the apartment. It's only a 5 minute taxi/bus ride to the larger resort town of Grand-Baie with its charming shopping arcades, restaurants on the water's edge and bars. "'Le Jardin de Pamplemousses", a unique tropical botanical gardens with giant indigenous tortoises & small zoo, is about 20 minutes drive away. "L' Aventure du Sucre", an old sugar mill converted into a stimulating museum, retracing the history of Mauritius, is also 15 to 20 minutes away. The island's capital, Port-Louis & its exotic markets, modern shopping complex & museums, is about 40 minutes bus/taxi drive. Other activities available in the area: snorkelling, waterskiing, quadbiking, kitesurfing, under-sea walking, deep sea fishing, glass bottom boats, boat/catamaran excursions to nearby desert islands, sea kayaking and much more. There are luxury hotels nearby with access to their evening entertainment for a fee. Pereybere is approximately 1 hours drive from the airport. On request, we will organise your airport taxi transfer with Nanda, our reliable English/French speaking driver. If he is not available, he will ensure a dependable airport transfer service through his contacts. The airport taxi transfer price (each way) is 1,700 Mauritian Rupees, payable to the driver.